In 1833 cholera ran rampant in most of Kentucky. Many, many people died, several in a family, sometimes the entire family. My gr-gr-gr-grandfather, William Peter Montgomery, was one of those who died of the dread disease in Washington County on June 19, 1833. 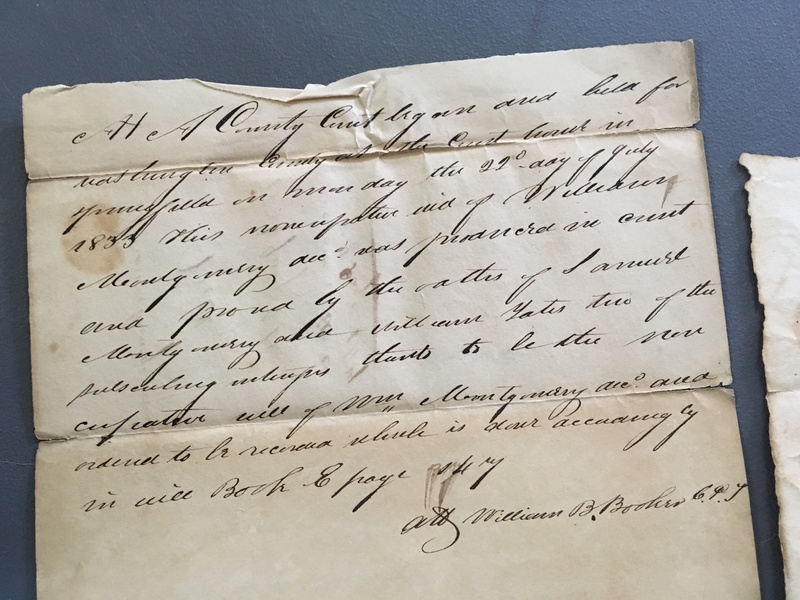 Yesterday, while at the courthouse in Springfield, I checked the probate records and found his nuncupative will – meaning an oral will that is written down by others. Evidently he was too ill to even sign the document. William’s wife, Polly (Yates), was eight months pregnant with their sixth child, William Peter, my ancestor, was born about six weeks or so after the death of his father. The older children were Charles W. Montgomery, Martha E. Montgomery, Henry L. Montgomery, Mary Rebecca Montgomery and Frances Edwina Montgomery. Son William Peter married Martha Ann Carrico December 30, 1862. The couple had ten children, including my great-grandfather, Robert E. Lee Montgomery. The Montgomery’s from William Peter and Martha Ann on are buried at St. Dominic Cemetery in Springfield. That parish began in 1843, after the cholera epidemic. 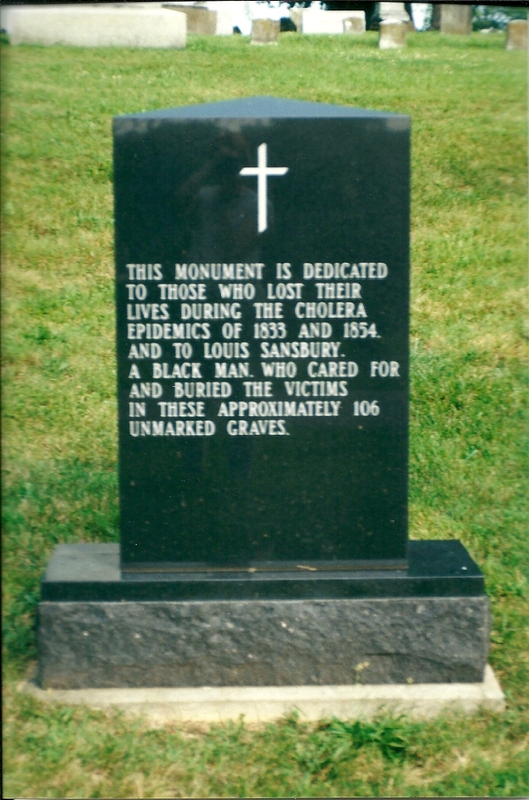 Springfield City Cemetery, also known as Cemetery Hill, has a monument dedicated to those who lost their lives during the cholera epidemics of 1833 and 1854. An unnamed black gentleman cared for and buried the victims. There are approximately 106 victims in unmarked graves. I assume William Montgomery is buried here, but cannot be sure. 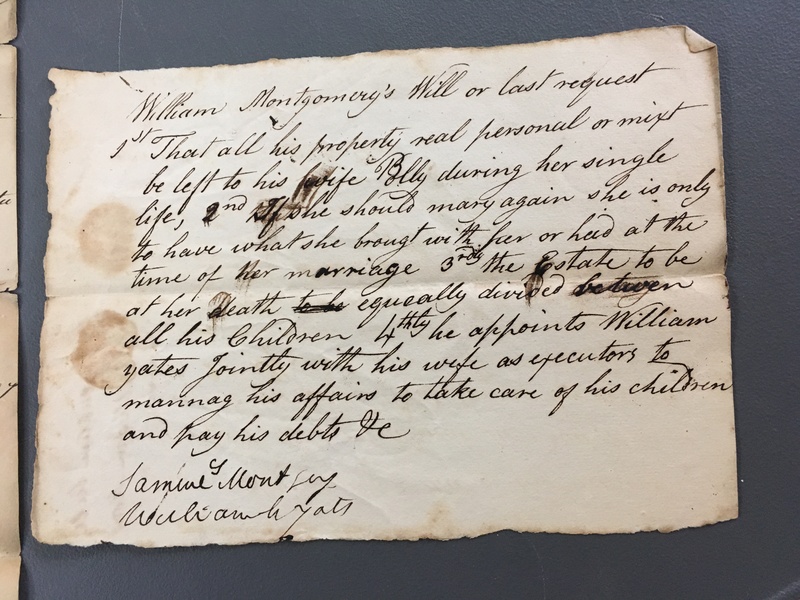 William Montgomery’s Will or last request. 1st That all his property, real, personal or mixt, be left to his wife Polly during her single life, 2nd if she should marry again she is only to have what she brought with her or had at the time of their marriage, 3rd the Estate to be at her death equally divided between all his children, 4th he appoints William Yates jointly with his wife as executors to manage his affairs to take care of his children and pay his debts, etc. At a County Court began and held for Washington County at the Courthouse in Springfield on Monday the 22nd day of July, 1833. This nuncupative will of William Montgomery, deceased, was produced in court and proved by the oaths of Samuel Montgomery and William Yates, two of the subscribing witnesses thereto to be the nuncupative will of William Montgomery, deceased, and ordered to be recorded accordingly in will Book E page 147. William Peter Montgomery and Polly Yates are my third great grandparents as well, also through his son William Peter. So we are cousins :). My grandmother was Mary Huston Rudd, daughter of Louise Mary Montgomery (1876-1957). How does that make us related? Hm, your grandmother is my first cousin twice removed, you would be my third cousin! Hello, Cousin!